I have Ehlers Danlos Syndrome. EDS is a connective tissue disease, that affects the collagen in your body. You can think of collagen like the glue that holds the body together, which meant my body was extremely hypermobile and loose anywhere collagen is normally found. This caused damage, such as sublocations, dislocations, and tissue tears. This forced me to live in constant, chronic pain. The severity such that I was prescribed at one point; 150mg of oxycodone and 90mg of morphine everyday just to get out of bed. I lived completely dependent on narcotics yet still had no quality of life because they did not address the pain for long as my tolerance to their effects quickly outpaced my stomach's ability to hold more pills down. This is when I was at my worst, complete hopelessness set in and I wanted only to die. As powerful as those feelings were, when my daughter was diagnosed with EDS as well, (as it is genetic) I realized I could not just escape to leave her the same fate. This is when I decided to educate myself and take the treatment of this disease into my own hands. I couldn't let my little girl see me give up or continue to use opiates to nauseum. I couldn’t let her think that was only life she had to look forward too. I couldn’t just wait for her to grow up and deal with chronic pain from the same disease. This is when I found cannabis. Once I started to incorporate cannabis into my daily life, I was able to control my pain enough to get through a physical therapy session, and come back to my workouts consistently to build muscle.Then, I introduced a full spectrum cannabis oil into my diet reaching up to 2,000 MG of THC a day for a month. I was also consistently working out, and now only eating clean, raw foods. This when when things drastically changed for the best and I began to have a quality of life again worth living. In October of 2016 I packed my daughter and I up and headed to Colorado to ensure safe and affordable access to my cannabis medicine. I had spent significant time advocating since 2014 for safe and affordable access to cannabis in Minnesota. While we were able to get access to medical cannabis, it was not affordable. When I left they offered a patient 1200 MG of THC medicine for $238 Cash Only, completely out of my price range. Fate would have it, that the house I rented would need to have the basement completely rehauled after a roommate had destroyed it. This is when, with the support of my landlords and city I decided to create the space for “Break the Stigma Fitness”, the first cannabis-friendly fitness facility in the world. We offer a safe and comfortable space for individuals to learn about and partake in cannabis if they choose while doing therapy exercise! Our experiences include Kickboxing, Yoga and HIIT cannabis-friendly group workouts, along with nutritional advice and cannabis education. Our mission is to change the perception of cannabis users by representing and presenting a healthy holistic approach to the mind, body and soul! Break The Stigma Fitness was issued a licensed in late August 2017, after many transparent conversations with zoning about what we would be doing here. In addition, I had a volunteer and friend speak to zoning on my behalf to verify that I would be following all rules and local regulations. They informed her, based on what the current rules we were compliant. The city had even disclosed they had been on my website and they were not concerned with what we did on the private property, they just wanted to make sure we had enough parking space and I knew clients could only park on the blacktop (No street parking). I agreed and was issued a general sales and business license on August 22 2017. I started taking payment in September after offering free experiences as we learned what worked for the community. As with most businesses, things evolved and I started building great relationships with brands and companies within the cannabis space that wanted to support my company's mission. Due to Colorado’s unique ability to gift up to an ounce of cannabis, some companies and I agreed I would obtain product in small amounts from them, and in turn gift to our clients so they had the option to enjoy the full experience we offered at no additional cost to them. It is very important to note that Break The Stigma Fitness does not monetize Cannabis and that any and all fees paid are for Fitness and Education classes only. Cannabis has never been a requirement to participate and students are aware that any consumption is done on a personal use basis and no Cannabis is for sale. I think it is important to know I was not making “extra money” off the products that we gifted to our clients. Please know I charge $28 for a two hour experience at BtSF (initially it was free, $15, $20, and most recently $28 after we extended the experiences to 2 hours from 1.5 hours. Keep this price in mind when you compare that to a 1 hour drop in yoga class rate of $20, and the price of a 2 hours paint and puff class where no sponsors samples are offered, but the experience is $52. I am firm in my believer that $28 is a bargain for a hour long yoga class, and an hour of education surrounding the endocannabinoid system and wellness. On 3/13 Fox 31 News visited BtSF to do a news story about what the facility offers, and the inspiration behind why it was opened. The intention of participating in this story was to share the positive benefits of Colorado State Constitutional Amendment 64 and I believe it to be 1st Amendment Protected Speech. This coverage went national by morning, and on 3/29 Break the Stigma Fitness was issued an immediate license suspension and notice of revocation. On this same day BtSF won “Best Cannabis tour/class in The Westwords “Best of” 2018 edition. 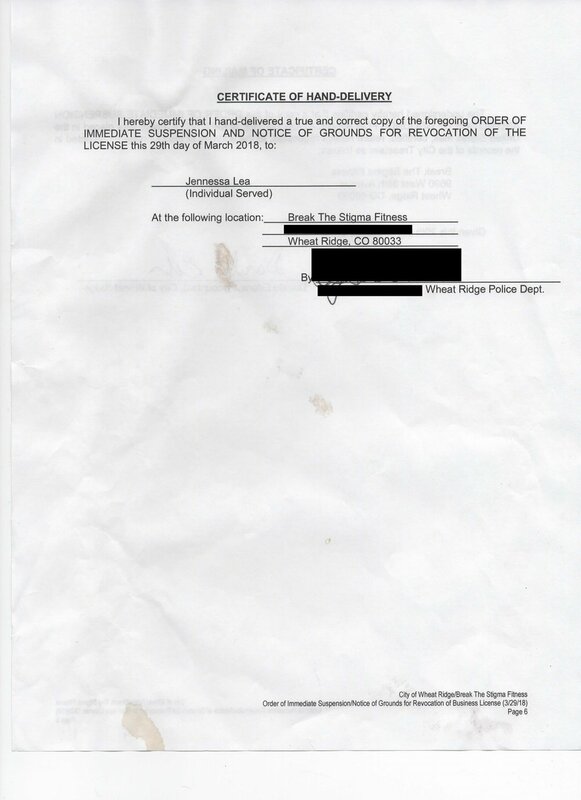 The 420 Games Business License I was also Issued as leader of Team Colorado so BtSF could legally host the Launch Party. -I was also given a temporary business license for an event titled “The 420 Games” at this same address where I was also transparent about what that event was, a cannabis friendly fitness event, which it clearly articulates in the title. -I had multiple conversations with zoning about what we offered and was always told they didn’t have interest in what we did on our private property. -In all interactions with local law enforcement I have represented myself as the Owner/Operator of “Break The Stigma Fitness” and that we are a Cannabis-Friendly Fitness Studio and we operate in a private residence. -I have had 2 signs on my property indicating “Cannabis-Friendly Fitness” Since Summer 2017. This was done to comply with the requirements for having a Home Occupancy Business. I am a single, disabled mother who created this space because I had great success and know what it’s like to be so helpless due to chronic pain, opiates, disease, and weight. I only seek to inspire and help others who may be in a similar spot so they have the tools to change their life while providing a livable wage for my daughter and I. In no way am I here to take advantage of my community and the government by illegally funneling money to myself through the value of products I offer in the experience. Also know, having BtSF in the basement was a short term option until i could raise enough capital to bring this to a brick and mortar, I had even mentioned this with FOX, but it was not mentioned in this broadcast. At this point I have been stripped of my right to offer experiences which has a direct impact on our clients quality of life, as well as the livelihood of the 4 instructors who work with me, myself and what I can provide for my daughter. It is imperative that Break the Stigma Fitness reopens to the community, which is why I am seeking your support. I have created a Go Fund Me to fund the Brick and Mortar and to help pay for my daughter Reagans and I’s living expenses while in transition and would be forever grateful for whatever support is provided. I have asked my city for a hearing to plead my case and hope to find a resolution to any concerns they have with my business. I will not let this stop me. I will continue to bring content surrounding cannabis, fitness and nutrition to clients and viewers all over the world via Instagram @fitcannabisgirl, Facebook @fitcannagirl , and now, on YouTube, https://www.youtube.com/channel/UC0jHz2cTFESR9qbB6NDJWVg?view_as=subscriber where new content, including "The Fit Cannabis Girl Show" is soon to come. I will also be updating my new web site, www.fitcannabisgirl.com with more original content, as well as updates to the above story. If you would like to show your support for this, please check out my; website & channels, then subscribe, follow and like to let me know. I am currently under a suspension of my business license, until this is resolved I can only accept donations for funding of living expenses and for the future Brick and Mortar Location. I cannot accept payment for classes at this time and any classes previously scheduled are required to be suspended until the License to operate is reinstated. Donations can be accepted on www.gofundme.com/hopeforbreakthestigmafitness or if you scroll to the bottom of this page and click on "Donate". Please know how much I genuinely appreciate everyone's support during this very difficult time.